You have got to hand it to this Figure in the Nine of Pentacles for she has doggedly stuck with the plan. She has studied, saved, studied more, focused and kept her head down. She has gained, lost and gained again. She has picked herself up after falling and failing, dusted herself down and got back out there. She had been determined and relentless in the pursuit of her goal. She is the ultimate success story. While the Wands were running amok, the Cups lost in love and blowing their money on partying and romancing, the Swords tying themselves up in knots, the Figure in the Nine of Pentacles has kept her feet firmly on the ground and steadily and quietly arrived at her destination. Her crops (her hard work and effort) have yielded well and her harvest is bountiful. As she approaches the closing stages of her cycle, her Pentacles are flourishing beyond her wildest dreams. Her original planting has sprouted and has very possibly grown in several directions creating even more bumper harvests and even greater success. The Figure is now at leisure to enjoy the fruits of her labours and all they can afford her. We can see her lovely house in the background and the beautiful countryside environment she has chosen to live in. She has achieved this success all on her own and is quite happy to enjoy it on her own as well. She is self-reliant and can be alone without been lonely. In fact she enjoys her own company so much she may find it difficult to share it with anyone else. She surrounds herself with objects of luxury and beauty and gains immense pleasure in all that she possesses. Success, prosperity and luxury are strong features of the Nine of Pentacles and the Figure can afford it all with plenty to spare. Her sustained efforts have made her financially secure not just for now but in the future too. Her gown is rich and expensive and she moves with a gentle grace suggesting that she can now take her time. Refined and elegant she walks with a noble gait, for she is Queen of her environment. The hard work is now done and she may retire or better still, develop that hobby that she has never had the time for. She has the freedom of choice now, and there is no urgency or stress in her life. She calls the shots and suits herself for this time is now about her. She has given her all for a long time and is now ready to take her just rewards. she will think nothing of splashing out on expensive items and pampering herself for she has earned it. No one can deny her this success even if we do envy her position. It is there for the taking for all of us should we want it bad enough. The Figure fondly strokes a Pentacle representing the beautiful and luxurious goods that her money has afforded her. Vines with bunches of ripe grapes grow abundantly suggesting the prosperity she has created and now enjoys. She is safe, secure and where she wants to be. She may no longer be young and perhaps realises that she has sacrificed a good deal of her life in hard work, but so what she may rightly think? Look at what she has now. She understands the price she has paid to get where she is; the lack of travel and frivolous holidays with friends and the lost opportunities for fun-filled romance. She has sacrificed part of her freedom over the years which is symbolised by the hooded falcon resting on her hand. The walled gardens suggest the security her status has brought her, but also that she may have cut herself off from others to reach her goal. These walls may symbolise how well she guards her possessions and achievements. They will keep intruders and thieves out. A Snail moves slowly across the well manicured lawn. The Snail is symbolic of the time it takes to reach a target or goal. Some things just can’t be hurried and it teaches us the Lesson of Tenacity and Patience. When we are working hard towards a goal it sometimes seems that life has stood still and we are getting nowhere. We look around and everyone seems to be moving faster than we are. This is when people give up or give in because they don’t see the results quickly enough. However, the Snail knows better. If we stare at the Snail it may appear that he is not moving at all, but it is for certain he is making quiet progress, even if it is not obvious. If we look away and distract ourselves for a short while before looking back, we will see that the snail has indeed moved if not gone altogether. As he sets off across the garden, he knows it will take him much time to get to the other side but this does not stop him making the journey. The snail is making his way to where he will feast on all the rich vegetation, so is quite certain it will be worth the effort. This takes us to another aspect of the Snail. 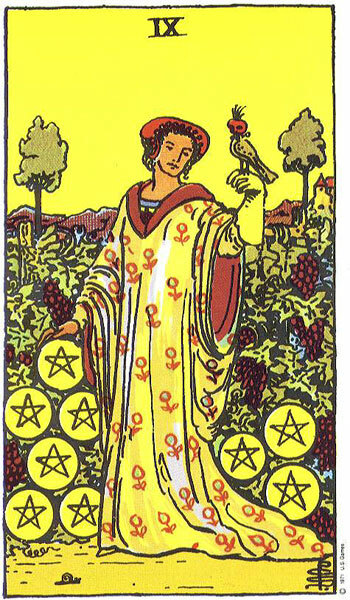 The Figure in the Nine of Pentacles stands in a well manicured garden in which her prize crops and plants flourish. A snail can wreak havoc in a garden and we must wonder why she has not taken steps to address this obvious threat. The Snail may be telling us that she does not have control over everything, regardless of her financial status and position. Money can’t buy you everything. Mother Nature is a law onto herself and will not be contained. On the other hand, the Figure, being a Pentacle, has a deep understanding and tolerance of nature and animals. Therefore she may have learned to live in balance and harmony with her surroundings instead of trying to suppress it. The Figure depicted in the Nine of Pentacles is a picture of health, and rightly so, for she has looked after her body, nourishing it and getS plenty of outdoor exercise. As this Card is a Nine, it suggests the end of a cycle. The woman may be entering her menopausal years as she naturally slows down, but this Card can also herald pregnancies and the imminent arrival of a baby due to its Nine association. Below is a continuation from The Eight of Pentacles Story. Many years have passed since we last visited the Stone Mason. He was on the brink of incredible success and was working flat-out, his wife too. Following in his father’s footsteps, his son had begun training as a Stone Mason. His daughter wild and restless, had not made any plans. We do know that he had bought a plot of land and was working on the design of a house he would move to with his family. He was in the process of handing over his current property and workshop buildings to the community to provide training for the local unemployed. He wanted to build somewhere really nice and special for his retirement. Yes, even though he was close to being a workaholic, he did intend slowing down at some stage so that he could enjoy the perks of his success…..
Story – What happened Next for the Stone Mason and his Family. As we arrive at the scene of the Nine of Pentacles, it is a beautiful sunny day, not a cloud in the sky and the air shimmers with the heat of the afternoon sunshine. We are on vacation in a beautiful area of the countryside and while having our breakfast in the hotel dining room we ask about the best place to go for a walk. The young waitress has a quick think before telling us about a particular area that has beautiful views and scenery. She also tells us that it’s where all the ‘big monied people’ live. ‘Oh you should see the fantastic houses out that way’ she says. ‘They are like palaces. You would need to be very wealthy to own a property there. You know, there are even a few celebrities living there too ‘ She sighs as she pours our coffee. ‘On my wages, all I would be able to afford would be a postcard of that area and nothing else’. As she heads back to the kitchen she jokes back to us. ‘If you find any stray rich men wandering around out there, make sure to bring one back for me’. And with that she is gone through the swinging doors. Well, that is sorted then we agree and hurry back to our rooms to prepare for our walk and whatever adventure the day has in store for us. Our hotel is in the town so we have to walk for some time before we get out into the open countryside. We have a small map which was kindly given to us by the hotel receptionist and a packed lunch supplied by the chefs in the kitchen. Oh, but it is a glorious day and it is so wonderful to be out in nature, getting some fresh air and that lovely warm sunshine on our faces. The further we walk the land becomes more lush and the scenery begins to change from sparse hedgerows and flat fields, to avenues of tall deciduous trees in full leaf and rolling hills. Every turn and twist on the road reveals more natural wonders to our delighted eyes. Powerful, sleek and shiny horses graze lazily in fields, their silky long tails swishing back and forth as they munch away. We stop to talk to them and one wanders slowly over to check us out, while the other momentarily raises its head before returning to its food. It is obviously not impressed with us. As we walk on, the road begins to climb and we can feel the pull on on our leg muscles as they take the strain. We then spot our first house, but just barely, for it is tucked away behind high trees and an almost equally high electric gate. As we are admiring the beautifully trimmed hedges and flowering shrubbery, the gates suddenly open and out drives an expensive looking jeep pulling a horse-box. We try not to look too obvious or nosy but grab a quick look in through the gate at the long stud-railed avenue that leads up to a stunning house surrounded by meticulously landscaped gardens. The gate closes and the jeep is gone. We continue to walk, talking now about what it must be like to live in one of those houses and the money that would be needed to maintain it. We discuss where the people may have got such money and we argue about whether it was inherited money are hard-worked for. Our discussion comes to a stop when our breath is taken away by the vision that lies to our left at the bottom of a valley. It is a long, long way down from the roadside we stand on. We decide, we have to go there and take a better look, for it is just stunning from where we are standing. So we walk the meandering roads, taking turns here and there as directed by the map. The hills are much higher as we climb the steep roads. They look almost like mountains and are covered in a shimmer of purple heather. We are much closer to the lake now but it is still far down below us. From where we stand, the water looks almost black. There is a small sand-like beach area on one side and A sheer mountainous cliff face on the other. It is magical, just like a scene from a mystical movie. A track or road appears to run from the lake and disappears into a small wood. The land around the lake is quite wide and sloping. We see movement in the fields and think it to be horses or cattle. We know we are taking a chance, and that the land we are about to enter is private, but we just have to get a closer look and take some photos of the lake. We hop over the low stone wall that borders the land and begin to scramble downhill towards the lake. Laughing and nervous all at the same time we are excited about our adventure and forge on. We keep climbing down but eventually are forced to stop for the land suddenly falls away before us. We find ourselves at the side of a sheer drop. This is as far as we can go without putting ourselves into mortal danger but decide it is an ideal place for us to picnic at. We spread our rug on the soft grass and lay out our lovely lunch under the blue skies and silently watch the scene below us. Again we see the movement of animals but can now identify them. To our amazement, a herd of deer move together across the field towards the lake and our cameras come out again. We pull out the mini binoculars which we had almost forgotten were in the bottom of our bag and take a closer look. The lake and surrounding area is too fabulous to put into words. We are speechless and humbled by its incredible natural beauty. Looking through my binoculars, I decide to follow the path or roadway that meanders away from the lake. I follow it to the woods where it disappears but I raise my binoculars and adjust the focus to see past the woods. There it is, a long, low house surrounded by a walled garden. ‘Wow’ is all that I can say. Someone is actually living down there and in the most beautiful house you can imagine. I further adjust the binoculars to get an even closer look. I can see another roadway that runs from the house and up the side of the hill to an entrance onto the road we had been walking. ‘So that is how it is accessed’ I say to no one in particular. ‘Now that is what I call a house and what a garden! Imagine having a lake in your back garden and a herd of deer’? I am almost overcome with envy. ‘ I just can’t begin to think of or guess how much a place like that would cost.’ I say, shaking my head at the notion of ever being able to afford something so amazing. I know I am being cheeky and intruding on private property but I want to see as much as I can. Straining my eyes through the binocular lens, I study the house once more and the walled garden surrounding it. I just can’t get enough of it and am hit by another wave of intense envy at the people who are lucky enough to live there. What a charmed existence they must have, what an idyllic lifestyle. Suddenly there is movement at the back of the house and I jump back fearing that I will be seen but it is just the binoculars, for we are too far away and well hidden in the bushes. No one knows we are here and we are confident we can’t be seen. I look back into the binoculars and this time I see a woman in the garden below. Now I am very curious. She might be a celebrity; an actress, a singer for all we know. She moves further into the garden and slowly walks towards the flowering plants and shrubbery. She is wearing a long elegant robe which flows behind her as she moves. She is not a young woman but has obviously looked after herself well. She moves with an air of Refinement and confidence. Her whole looks suggest money, and plenty of it. Is she the owner of this incredible place we wonder? She has her left arm raised and appears to be holding something but I cannot make out what it is. Oh, if only we could get closer. I want to get closer but my friend is beginning to get nervous. ‘What if we get caught?’ she worryingly asks. Agreeing she has a point I calm down and resign myself to our picnic blanket and the rest of our lunch. Oh, I would give anything to live in a place like that’ I declare as we eat our little pastries. ‘ I don’t know, I am not sure if I would like to be so isolated’ replies my friend. ‘It must get very lonely down there, even if it is a beautiful place’ she continues. ‘ I wouldn’t mind being on my own if I had luxurious surroundings as such and plenty of money to buy whatever I want. That would be all the company I need’ says I, but my friend comes back with ‘but is she happy, really happy do you think?’. ‘Why wouldn’t she be happy?’ I am astounded by the notion that she might not be happy. I realise now that I am quite a material girl. Whereas I see the luxury, splendour and glamour which would definitely make me happy, my friend is thinking about needing people around her and a simpler life in order for her to be happy. We discuss and argue this point for some time, me saying that I would move in tomorrow and my friend wanting something a little more normal and going on and on about money not being everything. We agree to disagree on this one and decide in the end that it is all down to personality, priorities and what we consider would make us the most happiest. It is bound to be different for everyone. As the girls chatter away, down below in the garden of the house beside the lake walks the woman in the long robe. Earlier that morning, she had waved goodbye to her husband as he drove up the long driveway to the main road. He was on his way to the airport where he had a plane to catch for the USA. Her husband was meeting with a well-known movie maker in Los Angeles to discuss the intricacies of Medieval Stone Masonry for authenticity on a movie set that was being designed and built for a big budget production. He would be gone for two weeks. Officially he was retired but everyone knew he was the best in the business and so the calls continued to come and he continued to be tempted by the more interesting projects. These projects took him all over the world and away from home for weeks at a time. The woman was used to that and was quite happy for him to go. She had plenty to occupy herself with anyway and was very self-reliant. She liked these times when she was on her own because it helped keep her sense of independence and self-identity. She looked forward to the peace and quiet of the coming two weeks. She knew her husband did not take on these projects because he needed the work. It most certainly was not for the money at this stage for they were financially very secure, if not incredibly wealthy. Her husband went because he loved his work and it gave him an interest. It also gave him money whether he needed it or not. There was a saying he used often over the years ‘if you have nothing, then it is hard to get anything but if you have something, it is easy to get more’. She knew how true this saying was for now that they wanted for nothing, had more money than they needed, the money still came in and in large amounts. They didn’t really have to make much effort at all now. All the hard work had been done in the past and now they were really beginning to enjoy their rich rewards. They were financially successful and their very success seemed to breed more success. No matter what they did turned out to be a success. Success followed them now but they had experienced failure too. Before the woman had met her husband, he had lost everything, and had, for a while, been living rough on the street. He had been a victim of the recession, gone from an up and coming, much in demand, Stone Mason, to losing his job, his house and having no money or food to eat, in a very short space of time. Life was indeed hard for him. He felt very demoralised after working so hard, for so long, and then ending up with nothing to show for it. As a very young man, a long time before the woman knew him, he had a dream, a vision, a goal that he was determined to realise. He had started off with just the shirt on his back and a small inheritance left to him by his grandfather, also a Stone Mason. He was determined to follow in his grandfather’s footsteps and become a Stone Mason himself. He had saved his inheritance and worked hard so that he would have enough money to see him through his apprenticeship. He had lived a very quiet life back then; working all day, studying, sleep and then back to work the next morning and the same thing over and over again. He was determined and had learned much from his grandfather. He knew he had years ahead of him where he would earn very little but that if he stuck with it, he would eventually qualify and the world would then be his oyster. If it hadn’t been for the recession back in The Five of Pentacles, it would all have worked out as planned no doubt, but then again, who knows where he would be now and what he would be doing? He had always wanted to work for himself so the woman is very sure he would have set up in business, maybe not what he is doing now or has done, but no doubt something similar. She knew her husband well and was very proud of what he had achieved. After she had closed the door that morning, the woman enjoyed a leisurely breakfast and read through the post. She picked out her favourite Horticulture Magazines that arrived each month and relished flicking through the pages, reading articles here and there that caught her fancy. The sunlight poured through her kitchen window and she sat there for some time staring out at the tall rock face that bordered the lake behind the woods. She was alone in the house and would be for most of the time her husband would be away. Her daughter would visit maybe once or twice but she was a busy girl and did not have much time. She ran a very successful stud farm along with looking after her young children. She also helped her horse-trainer husband when she could. It was great to see her when she called, but the woman understood how busy she was. She had been like that herself when she was younger, and she too had young children to raise, a business to run and also helped her Stone Mason Husband. After breakfast, she took a long soak in the magnificent roll-topped bathtub. It was antique and had cost a fortune to restore but it was worth it. As she lay in the bath, she thought back to when the house was first built and the fun she had decorating it bit by bit. They had wanted only the best in the house. They preferred quality instead of quantity and both had a keen eye for style. Her husband’s weakness was art and he had made substantial expensive purchases over the years. These beautiful paintings now hung on the walls in their dream home and they never tired of admiring their beauty. The woman’s own weakness was antiques and she had carefully planned the interiors to incorporate magnificent pieces that she had searched long and hard for. They had both agreed that a time would come when they would cut back their workload and live a more leisurely lifestyle. They loved their work and careers but they also wanted to explore others aspects of their personalities. They had hobbies and wanted to spend more time developing them. They also just wanted to relax and not be constantly pushing themselves. However, none of this could be done until the had achieved what they set out to do, so they kept their heads down and kept going. They would not stop until they had enough money to enjoy a financially secure retirement. The house had been their dream, their ultimate goal and it was to be a testimony to all they had worked for and achieved.They knew what they had wanted in a property and the kind of location for it. They had talked about it for over 15 years and it seemed nearly as long finding the right place once they had decided the time was right. They could have bought several sites over the years and thrown up a variety of perfectly acceptable luxury houses but they had very specific requirements. They would wait until the perfect one arrived. Patience was something they were very familiar with and they both agreed that nothing of value ever comes easily. They had individually, painstakingly set up small businesses and then worked harder than they thought possible to make those businesses grow and grow. They were both ambitious and worked well as a team. They supported each other and made little personal demands for they knew they were working towards a mutual goal. After her long soak in the bath, the woman spent some time in her dressing room, choosing what she would wear. Today, it had to be something exquisite she thought. She had a group of foreign horticulturist enthusiasts coming for a private viewing of her garden. She would also host lunch and give a short talk. Since she had handed over the reins of her preserve making business and cookery school to her daughter-in-law, she had indulged her interest in growing rare specimens of fruit bushes. Her walled garden now boasted a selection of exotic fruits and it was the rare specimen grapes that everyone was coming to see and taste today. It had cost a lot of money to first find and then cultivate them but she enjoyed every second of it. She chose a beautiful deep orange silk long robe with a red crushed velvet collar. The robe was hand embroidered with red flowers and symbols of Venus. On her head she placed a matching hat. Slowly and gracefully she walked out through the large glass doors and into the garden where she stood in the sunshine for a few minutes, breathing in the heavenly scents of her flourishing garden. She then moved to a large building at the far side of the garden and opened the door. Inside, she took a long yellow leather glove from a hook and preceded to open the door of a cage close by. Moving slowly and purposefully she entered the cage and held out her gloved hand. Out of the dark there was a ruffle of feathers and a whooshing noise. A falcon landed on her gloved arm and the woman spoke softly to it. She then placed a red hood over his head without any protest from the bird. She had done this many times and the bird accepted it. She then made her way back to the garden. In the garden she examined all her plants and fruit bushes as she spoke to the falcon on her arm. She closely inspected the vines that would be the centre of attention later in the day. Heavy bunches of rich, ripe grapes hung form the strong vines. These grapes did not come cheap and she had a growing list of private clients who were prepared to pay for such delicacies. Another success, she thought to herself. She had not intentionally set out to make money from her hobby but yet again, it had happened. She was being rewarded for all her hard work and effort. It seemed to come naturally now. Beside the grapes grew a crop of healthy large Pentacles which were her husband’s own project. It was the Pentacles that had earned them their first big success and had opened many doors for them. The Pentacle Plants are what saved her husband from complete destitution after he had lost everything in the recession. They would never forget their significance and all they had to be thankful for. Her husband had learned how to grow Pentacles from seedlings and cultivated them until they were ready for harvest. They were a huge success and he had established a strong business on the back of it. Their son, also a Stone Mason took over the business some years ago and it continues to thrive. The woman strokes the large, ripe, golden Pentacles and appreciates what they have afforded them over the years. Because of the Pentacles, they are now in a very advantageous position. They are wealthy and continue to add to their wealth. They can buy anything they want and can now enjoy the fruits of their labour. As the woman strolls through the garden she realises that she now has time to smell the flowers and enjoy her lovely home. She looks to the falcon and knows that he too understands. She is no longer young and knows that she made many sacrifices in her life to get to where she is today. She did not enjoy the freedom that many of her friends had. While they had holidayed over the years and enjoyed hectic social lives, she had been working hard. She had worked all the time her children were growing up and had studied at night while they slept. She had left them in childcare so that she could run her workshops or make her preserves. The hooded falcon is a symbol of the freedom she denied herself and the price she had to pay to get what she wanted. She knows that the world at large looks in on them and envies what they have. They do not always understand the lengths they have gone to, to achieve this apparent success. She bought the falcon because of his predator qualities and had always wanted to learn how to handle them. She had applied herself to the training of this Falcon with the same determination and discipline she approached everything she set her mind to. She was enthralled by Falcons and had watched them in the wild on many occasions as they hovered high in the air, their eyes honed in on their quarry. Once the Falcon had set its eye on what it wanted, nothing would deter it from acquiring it. Determined and single-minded, it would swoop and triumphantly hit its target each time. Watching the Falcon at work was very symbolic for her and at times she had modelled herself on this great bird of prey whenever she wavered off her path or doubted her abilities. She thought of what the falcon would instinctively do and found she could then re-focus. Now that her success is guaranteed it does not automatically bring freedom. It must be maintained and guarded. The contents of her house alone are worth a King’s Ransom. Should someone break in and destroy her garden, what then? As a family they are worth a lot of money and with that brings the worry about personal security. ‘Yes my lovely Falcon, you may think me free but I am as trapped just as much as you are’ she speaks softly to the bird. ‘No amount of money can buy you freedom. Money just enslaves us but I understand that and accept it, for this is the price I have paid to have this beautiful house and all that comes with it. The woman stares at the wall around her garden and checks to see if the security cameras are working. She is unaware of the two women high up on the hillside eating a picnic on her land. She is also unaware that she is being watched. Tonight she will dine alone and be very comfortable in doing so. She will eat well and enjoy some excellent wine from the cellar and look forward to a phone call from her husband. She has not had the time to form close friendships over the years but she does not feel deprived. She enjoys her own company and relaxing in her beautiful environment. If she is not too tired, she might update her blog about the guided tour today and gives some tips on preserve making. She may be retired now but there is still always something to be done. She is happy though and very content. She couldn’t ask for anything more. *****When we next visit the Pentacles in Card Ten, we will see if they have managed to hold onto their success and wealth or has it all disappeared again? Will they be back at the Five of Pentacles, down and out or will they be living the life of luxury and adding to their existing wealth. Are they truly a success story? How long can they keep it going for? Is it possible for them to become even more successful? We shall find out all the answers very soon, for like the rest of the Suits, they are nearing the end of their cycle, their journey through the Minor Arcana, and the Universe will demand results and answers from all of them. Thank Melanie, glad you found it interesting. Thanks, and yes it did. Still a couple of more years to go I’d say! Thank you so much for sharing your wisdom with us! 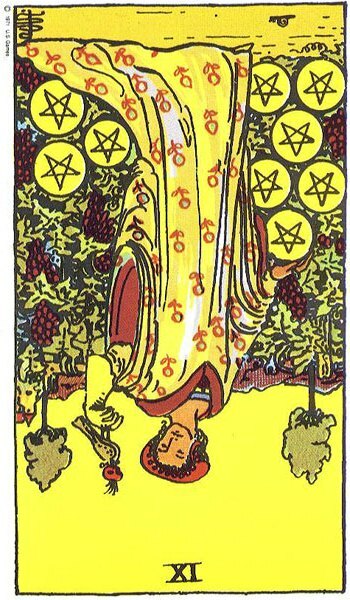 Just a question, This card, the IX of pentacles, keeps appearing in my readings but I am not that woman, I wish I was though. The description of this card fits to a tee what I would like to be living now, financial security, relax, enjoying my hobby, and I am also a middle-aged woman. I do not know what to think. Maybe I want it so badly that somehow it appears in the cards or maybe -and I am afraid this may be wishful thinking- it is an influence in my future? How can I find a meaning in these cases? Thank you, Vivien, for all your generosity and help. In what context does the Nine of Pentacles appear? What are you asking about? What is the background? The context is a professional/personal one: I have been a translator for more than 20 years now, and I have a good professional reputation, but I have to work long hours in order to earn a living, sometimes 10 hours in a day, so much so that the work is eating all of my life. So I try to find other better paid translator jobs/translator areas of expertise. And I dream with having my mortgage paid, having more time with my daughters, having time to read novels, having a beautiful house, and so on. In this context I read the cards. I want to know if I my professional future will improve and therefore I will have more free time and no financial worries. This card appears when I cut the deck and I look at the cards to see how to interpret the reading. The IX of pentacles is there, or else the IX of pentacles appears in the cross of the celtic cross reading. Vivien, thank you so much for your interest. I do not want to take advantage of your knowledge. I am curious because this card keeps appearing and maybe a little afraid it is wishful thinking. How do I interpret cards that appear this way? Oh, I hear you, I hear you. Gosh the Nine of Pentacles is the dream isn’t it? I do think your deep desire to be financially secure and to have the luxury of time on your hands to spend with your daughters, to do the things you want, to explore your other talents, to linger when and where you want is the dream alright and may be influencing the draw of cards. The needs you listed above all reside in the realm of the Nine of Pentacles. You do not mention your age but have been a translator for 20 years. You are most likely in your late thirties or forties then and again another reflection of the Nine of Pentacles. Now, you do not mention if you work for yourself or are employed by another. The Nine of Pentacles is a strong card for self-employment, self-reliance and using your natural resources and talents to improve your lot. I wonder if this card is telling you you have the necessary ingredients to achieve the success you desire but that it will not be secured by being employed by another, or perhaps to start something yourself on the side. The Nine of Pentacles suggests you are very talented and resourceful. How can you use your skills to make more money? Perhaps set up an agency for other translators, an online service, training, putting together a course on becoming professional translator and sell online or teach directly. I think this card is asking you to go for a long walk somewhere so that you can think all this through. I would suggest going to speak to organisations that may be able to help you put a plan together. You may have been doing the same thing for too long now and need a new approach. It is time for you to be the boss, to run things instead of doing all the running. Now you might say you are already the boss and working for yourself, but the Nine of Pentacles is suggesting you are not getting the rewards you should for all the effort put in. There has to be another way. Do a reading after connecting with the female figure in the Nine of Pentacles. Tell her your predicament, although she already knows it, implore her to communicate her thoughts and ideas to you through the cards and then do a reading based on how she can help you emulate her success. Her constant appearance must not be ignored. She is trying to tell you something and although you acknowledge her constant appearance, you have been too busy to hear anything she might be telling you.